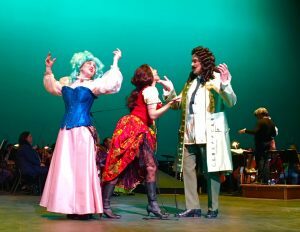 It’s the 100th anniversary of famed composer and conductor Leonard Bernstein’s birthday, and to help celebrate, Anchorage Opera is collaborating with Anchorage Symphony Orchestra to present Bernstein’s operetta Candide with book by Hugh Wheeler. Join Stage Talk guests Teresa K. Pond (Stage Director) and Conductor Charles Prince (son of Broadway director Hal Prince) today as they talk about this work based on Voltaire’s novella of the same name. Candide performs in the Atwood Concert Hall April 7 and 8. ORIGINAL BROADCAST: Friday, April 6 at 2:45 p.m.